If for your Sizes have changed order due to an import or a mistake, you can simply apply a new "corrective" Size Chart to re-establish the right order. Note: If you have an existing Size Chart in Brandboom with correct ordering, the system will do its best to recognize and keep Size values in order based on the existing Chart when you import new products. 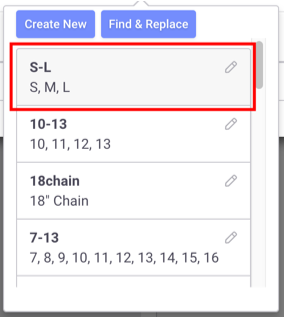 In this example, the Sizes are now shown in the order M, S, L.
To get it to display S, M, L, just create a new Size Chart in that order and apply it. Or, if the correct Size Chart already exists in your list, just apply it. 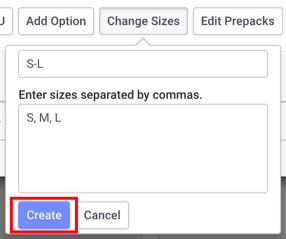 Click "Change Sizes" and then click "Create New"
The new Size Chart should now be applied.